I'm going to try to not make a habit of this, but I also do need (as in legally) do this at least a few times. If you read my other blog (Shattered Refractions) then you've probably read me gushing that someone actually picked up a short story that I wrote. The collection that that short story appears in has gone on sale today. Corrupts Absolutely? Is a collection of dark speculative fiction that essentially asks "what would real people do if they had super powers, as opposed to all the straight and narrow goody two shoes in comics?" After all, power corrupts and absolutely power corrupts absolutely, right? 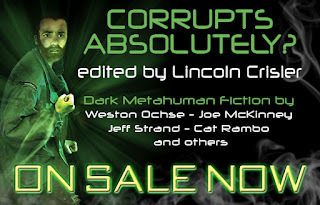 Aside from my own story, the anthology includes works from Weston Ochse, Cat Rambo, Jeff Strand, Joe McKinney, and many others. You can find out more about the book, and buy it, by clicking here. Also, act fast as Damnation is slowly raising the price today until it reaches its normal retail value. So the faster you act, the more you'll save. I'll update later with links to Amazon and Barnes and Noble as they pop up. Also for those interested, the editor has put up the first of 5 virtual panels featuring authors from the works. You can read that here.